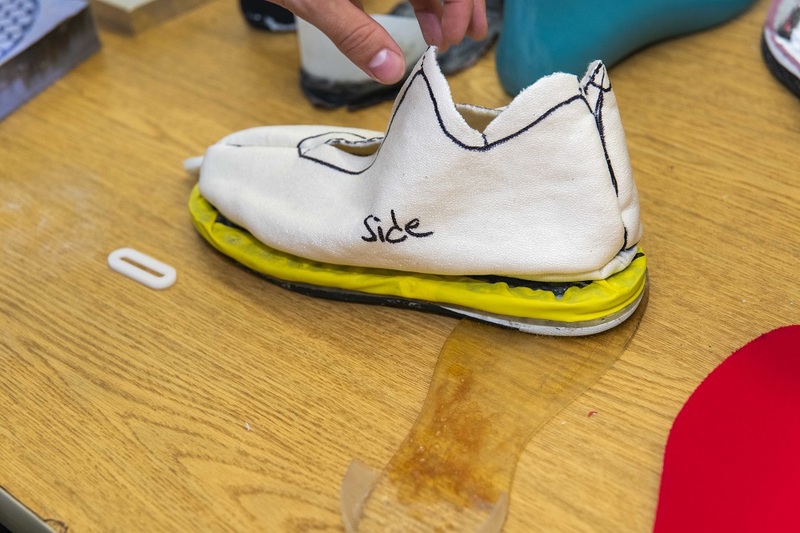 A team of student engineers at Worcester Polytechnic Institute (WPI) has developed a working prototype of a new type of sports shoe sole designed to reduce the incidence of non-contact knee and ankle injuries in organized sports. The shoe is a response to the large number of ankle and knee injuries—notably to the knee’s anterior cruciate ligament (ACL)—that plague amateur and professional athletes. According to the Journal of Athletic Training, the knee joint is the “…second most commonly injured body site after the ankle and the leading cause of sports-related injuries,” with more than 43,000 injuries occurring in high school athletes each year in a recent five-year period. The WPI shoe works by limiting loads to the ankle and knee, where many injuries occur. The key design element is a set of “goat’s-head springs”—tiny flexible polymer pieces whose name is a reference to WPI’s mascot. The springs are curled like goat’s horns, wrapping around posts that restrain, or localize, their deformation. The shoe recovers its initial configuration between steps, and the user may not notice that the shoe has responded to a potentially dangerous situation. “The idea is that work from the effort exerted when someone is running and cutting would be absorbed by deforming the springs instead of tearing an ACL or spraining an ankle,” said Christopher Brown, professor of mechanical engineering, who is guiding the student team. To develop early prototypes, the WPI team used a band saw to slice the sole horizontally, and install a low-friction interface where the load transfer is controlled by the goat’s head springs. Jessica Shelsky, who received a bachelor’s degree in biomedical engineering and mechanical engineering from WPI in 2012 and a master’s in mechanical engineering in 2014, was a member of a student team, advised by Brown, that developed the shoe’s original design. “It was an amazing experience to be a part of a project from the early concept phase all the way to the first prototype developed,” she said. She said the other members of her project team, Michael Doyle ’12 and Nicholas Workman ’12, brought various strengths to the effort. “Without this diverse group we would not have been as successful in developing a solution that could be patented and further developed,” said Shelsky, who now works as a senior manufacturing engineer for a medical technology company. Twelve undergraduates worked on the project this summer, funded through the investment from SEI. They are seniors Alex Alvarez (aerospace engineering) from Sellersville, Penn., Kyle Mudge (biomedical engineering and mechanical engineering) from Cumberland, R.I.; Tristin Carlton (mechanical engineering and materials science) from Coventry, R.I.; Ben Aldrich (biomedical engineering) from Rumford, R.I.; Julia Dunn (biomedical engineering) from Jericho, Vt.; Paula Sardi (mechanical engineering) from Cali, Colombia; Ethan Shipulski (mechanical engineering) from Hanover, N.H.; junior Josephine Bowen (mechanical engineering) from Lunenburg, Mass. ; sophomores Eric Motler (mechanical engineering) from Albany, N.Y.; Colin McNamara (mechanical engineering) from Arlington, Mass. ; Nate DeSisto (mechanical engineering) from Orono, Maine; and Mary Kandaras (mechanical engineering) from Arlington, Mass. WPI graduate students working on the project are Allysa Grant ’18 from Framingham, Mass., and Jimmy Muller ’18 from Medford, N.J. Additionally, WPI has had the support of three students from École Nationale d’Ingénieurs de Saint-Étienne (ENISE) in France; Corentin Roland, Valentin Delache, and Axelle Vialette. Learn more about the WPI student team working on the project in this profile in the Daily Herd.